California is a state filled with contrasting climates. The climates range from mountainous areas, to redwood forests to desert areas which are too hot to visit in summer. While most people think of Hollywood with its palm trees and clear blue skies, or San Francisco with its fog, the State contains vast varieties of climate zones. 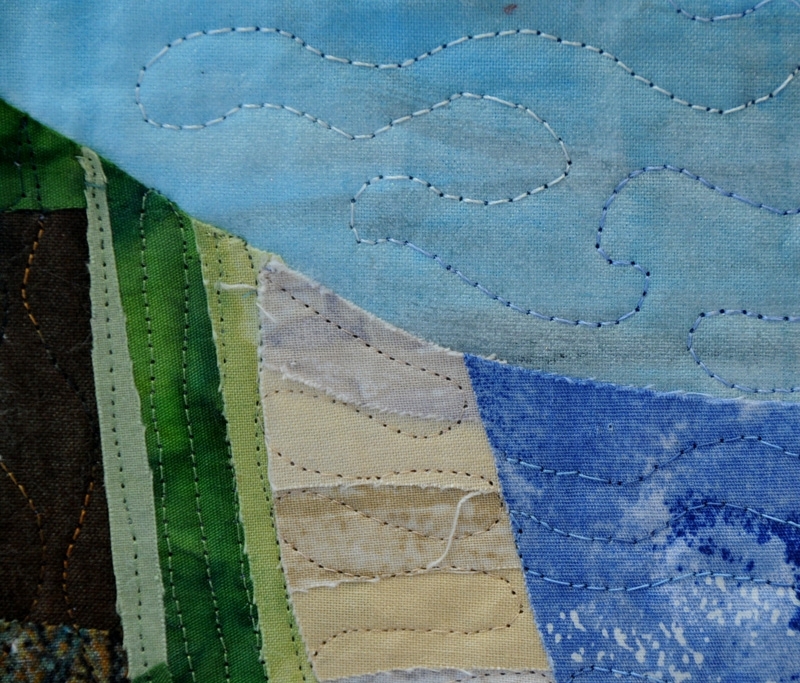 This quilt is portrays a cross section of the land and climate in Southern California. It starts with the ocean, and grey skies. The coastal areas in Southern California are kept cool thanks to “marine layers” which are often referred to as “June gloom” in summer—-because June skies are typically grey and overcast due to the marine layers which are prevalent on summer mormings. Next to the beach areas are green swaths of land, including gardens and agricultural land, which require regular watering to keep them green, as Southern California has a desert climate. As one goes further inland, the landscape changes to desert—-a dirt rather than a sand desert. After going inland for about 60 miles, one can choose to continue on the low road to desert towns such as Palm Springs, or one can start climbing up the mountains through high desert and pine forests to reach man-made mountain lakes and ski areas. It is truly possible to ski or snowboard in the morning and surf in the afternoon. 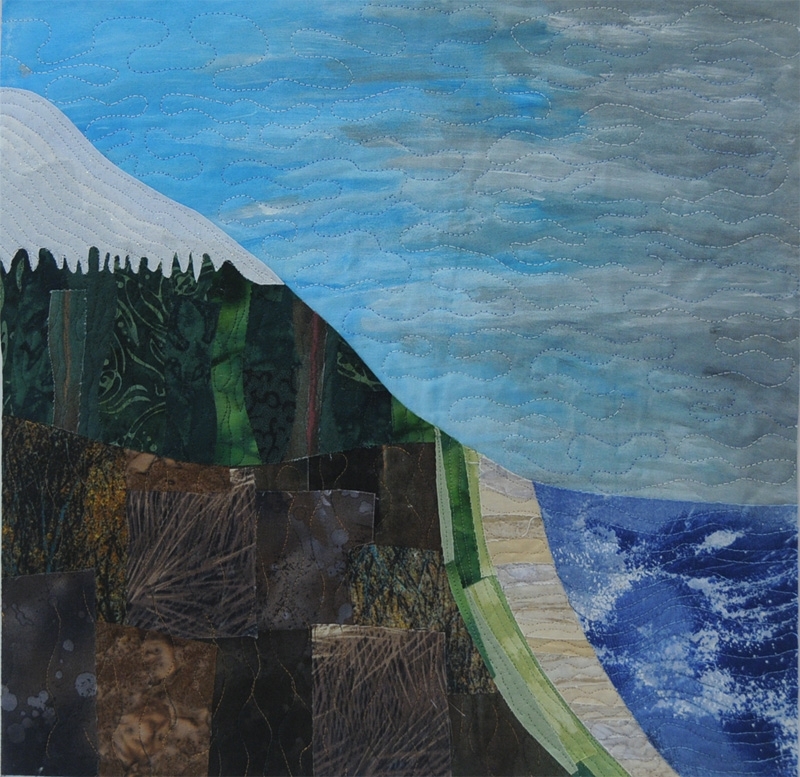 California—A State of contrasts is made using my own hand-painted sky, commercial print and batik fabrics, hand dyed fabrics, cotton batting, silk and trilobal polyester threads. It is free motion quilted on a domestic machine. Susan, I think you’ve used fabric and line very effectively here to illustrate your interpretation of the theme. I am struck in particular by the power of the skies (grey to blue), the ocean and the mountains, which dominate the piece — undoubtedly a reflection of how the geography influences the weather in SoCal! it takes me back to my trips to SoCal with you.